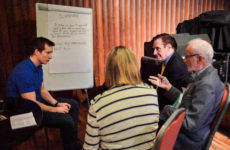 The Athlete’s Commission was formed shortly after the 2016 Summer Olympic Games, with the vision of ensuring that Ireland is the best country in the world to be an Olympian or an aspiring Olympic athlete. Our mission statement is to support the welfare of Irish Olympic Athletes and in doing so ensure that their voice is represented during all parts of the Olympic journey. Today’s opening address was delivered by Athletes’ Commission Chairperson and Olympian Shane O’Connor. Shane competed in the slalom at the 2010 Winter Games in Vancouver. He works tirelessly in advocating for the athlete voice and athlete welfare across all areas of the Olympic movement. 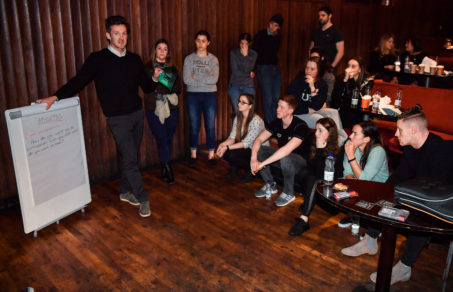 Speaking at the event is Team Ireland Athletes Commission Chairman Shane O’Connor at The Sugar Club in Dublin. 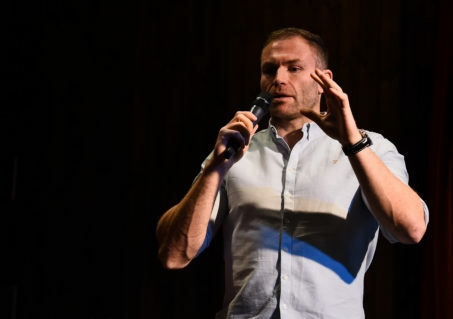 Damian Browne is a former professional rugby player, traveller and adventurer from Galway. After a sixteen-year rugby career, injury forced his hand and he made the tough decision to retire. During his down time from intense competition, Damian indulged his passion for travel and adventure. Last February he completed a solo row across the Atlantic in just over 63 days, and in his presentation, he brought us through that journey, using video blogs from the row to bring alive some of the challenges with which he was faced, and describing the tools he used to deal with them. 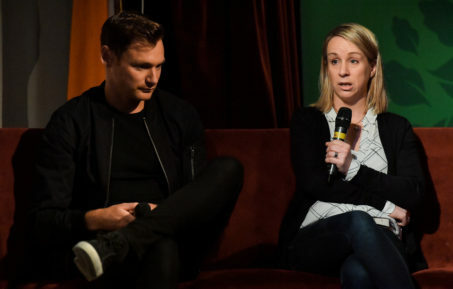 Some of Ireland’s best known Olympians gathered on the bench with Sports Psychologist Kate Kirby to talk about the challenges that sometimes present themselves on the Olympic qualification journey – offering tops on how to deal with them. Evanne is an Irish sports journalist and television presenter, who works as a sports news presenter on RTÉ News. 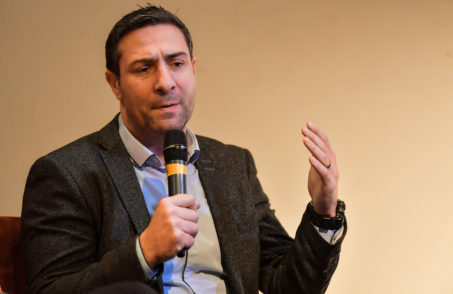 The Kilkenny native has been covering Olympic sport with RTÉ since the Athens Games in 2004 and is passionate about the important role that sport plays in people’s lives. 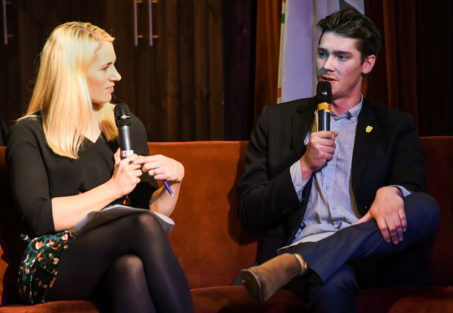 Speaking at the event is MC Evanne Ní Chuilinn during a panel discussion with Irish Olympian Seamus OConnor at The Sugar Club in Dublin. Derval is an Irish Olympian who competed in the 2004, 2008 and 2012 Olympic Games, specialising in the 60 and 100m Hurdles. The Waterford born athlete was crowned World Champion in the 60m Hurdles at the World Indoor Championships in 2006 and won two silver medals at the European Championships in 2006 and 2010. Derval also is a member of the Olympic Federation of Ireland’s Athletes’ Commission. 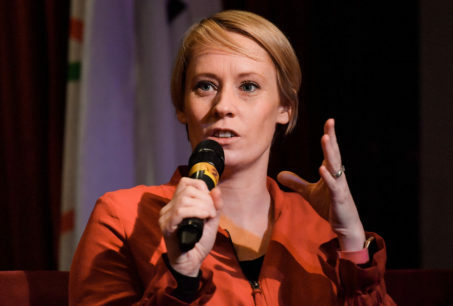 Speaking at the event is Irish Olympian Derval O’Rourke. Kenneth Egan is an Irish Olympian who won a silver medal in the Olympic Games in Beijing 2008, competing in the 81kg Light-Heavyweight boxing final. 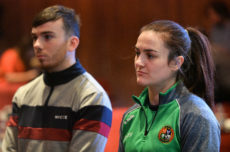 The Clondalkin boxer is a three-time gold medallist in the EU Amateur Championships and has two bronze medals from the European Amateur Championships. Kenneth is also a member of the Olympic Federation of Ireland’s Athletes’ Commission. Speaking at the event is Irish Olympian Kenneth Egan at The Sugar Club in Dublin. David Gillick is an Irish Olympian who competed in the 400m Sprint at the 2008 Olympic Games in Beijing. The Dublin born runner was crowned European Indoor Champion twice – in 2005 and 2007 and won bronze in the 4 x 400m relay at the European Indoor Championships in 2004. David is also a member of the Olympic Federation of Ireland’s Athletes’ Commission. 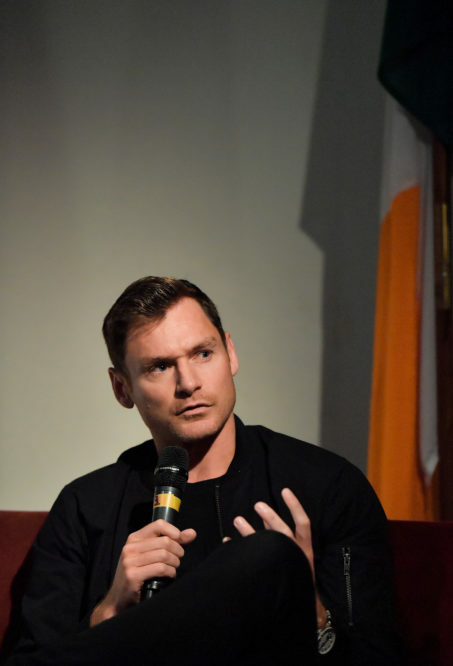 Speaking at the event is Irish Olympian David Gillick at The Sugar Club in Dublin. 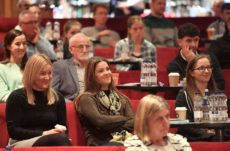 Dr. Kate Kirby is currently the Head of Performance Psychology at the Sport Ireland Institute. She has worked at the highest level of sport for over a decade and has provided her expertise to numerous governing bodies, including Irish Sailing, Rowing Ireland, Hockey Ireland, Tennis Ireland and Horse Sport Ireland. Kate has worked closely with many of our top Olympians throughout the Games, including Olympic Silver Medallist Annalise Murphy. 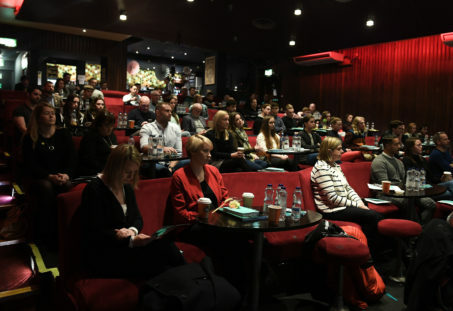 Speaking at the event is Sports Psychologist Dr. Kate Kirby at The Sugar Club in Dublin. 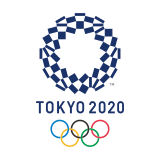 Tokyo 2020 is inspired by ‘infinite excitement’ in its venue concept – with venues spread across the heritage zone which was used in the Tokyo 1964 Games, and the Tokyo Bay Zone. 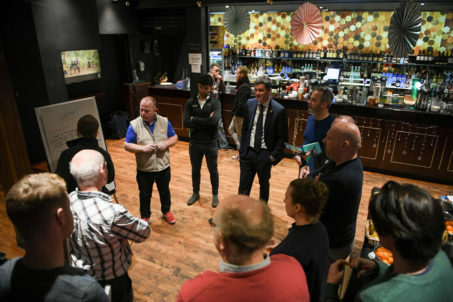 Team Ireland CEO Peter Sherrard described howo Tokyo will look, giving an overview of some of the recent Olympic Federation of Ireland updates as well. 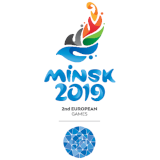 We have begun to engage with other athlete representative bodies on the international scene, most recently the AthletesCAN movement which includes athlete representatives from Canada, Germany, Holland and GB. 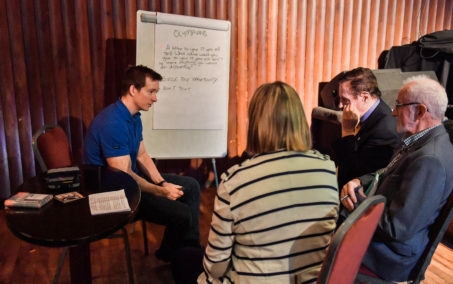 In order to plan a programme of activities for 2019, the Athletes’ Commission designed an interactive session to seek feedback from the guests – asking athletes, former athletes and support staff to dissect the strategic plan and to discuss a few key points. This will be help guide how the Athletes’ Commission talk to athletes. 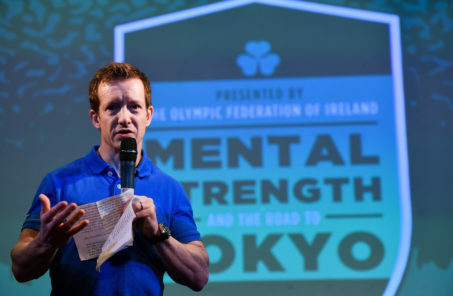 Athletes’ Commission Chair Shane O’Connor asks experienced Olympians to “write a letter to their 17 year old self” giving advice to aspiring Olympians. Vice-Chair of the Athletes’ Commission Gavin Noble hears from some of Ireland’s top current athletes. Coaches, performance directors and support staff are a key part of the journey for all aspiring Olympians, and today they discussed some of the challenges for athletes, and how the Athletes’ Commission can provide valuable assistance.